Yassmin Abdel-Magied is a writer, social advocate, and an engineer. She helps women, youth, and ethnic minorities develop their communities. At 16 years old, Abdel-Magied created Youth Without Borders, an organization that provides programs, opportunities, and support for youth to create positive changes in their communities. Abdel-Magied was born on March 3, 1991 in Sudan and moved to Australia with her parents just before she turned two years old She received the Dean’s Excellence Scholarship from the University of Queensland. In 2011, she graduated from the University of Queensland with a Bachelor's degree in Mechanical Engineering In 2012, Abdel-Magied started working on oil and gas rigs as a field engineer (Measurement and Logging While Drilling specialist). In 2014, she moved to Perth, Australia to work as a drilling engineer on offshore rigs. Abdel-Magied has served on multiple boards and councils, including the boards of the Queensland Museum, the Australian Multicultural Council, the Queensland Design Council, United Nations Youth Australia and others. She currently sits on the board of ChildFund Australia, the Council of Australian-Arab Relations and OurWatch. In December 2014, Abdel-Magied presented her first TED Talk about implicit bias. 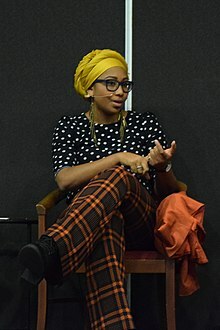 She published her first book, Yassmin’s Story , in 2016 with Random House. In 2007, Abdel-Magied received the Young Australian Muslim of the Year award. In 2010 she received the Young Queenslander of the Year award, in 2011 she was a finalist for the Queensland Young Australian of the Year Award. She was the winner of the Youth Leader category in the 2012 Australian Financial Review and Westpac 100 Women of Influence Awards and the youngest woman on the list. In 2015, Abdel-Magied was one of the finalists in Young Australian of the Year, being named Queensland Young Australian of the Year. Abdel-Magied founded Youth Without Borders in 2007 and has been the chair of the organization since its establishment. The organization provides programs, opportunities, and support for youth to create positive changes in their communities. One of the projects is a library for children and youth on a motorcycle. This motorcycle travels to villages that do not have access to libraries in Indonesia. ↑ “Breaking down borders and bias: Yassmin Abdel-Magied,” Committee for Economic Development of Australia, accessed February 18, 2016, http://www.ceda.com.au/events/eventdetails/2015/7/w150723?EventCode=W150723. ↑ “Yassmin Abdel-Magied,” The University of Queensland Australia, accessed February 18, 2016, https://www.eait.uq.edu.au/yassmin-abdel-magied-1. ↑ “Yassmin’s Story,” Random House Books Australia, accessed March 9, 2016, http://www.randomhouse.com.au/books/yassmin-abdel-magied/yassmins-story-9780857986153.aspx. ↑ “National Finalist Young Australian of the Year 2015,” Australian of the Year Awards, accessed February 18, 2016, http://www.australianoftheyear.org.au/honour-roll/?view=fullView&recipientID=1171. ↑ “100 Women of Influence 2012,” 100 Women of Influence, accessed February 22, 2016, http://www.100womenofinfluence.com.au/alumni/2012-2/. This page was last changed on 5 December 2018, at 04:51.